Canned Fresh Air @ 5 Chinese Yuan A Pop ! It’s not sci-fi, it’s not fantasy, it’s not a story out of The Lorax….it’s really happening! These canned air comes in a variety of flavors, including “pristine Tibet” and “post-industrial Taiwan”. 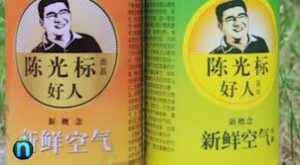 According to a Huffington Post translation of an earlier report in the Chinese language Beijing Youth Daily, Chen has been selling his canned air since September, 2012, with more than $800 worth of canned air being sold in Beijing on the very first day. Even though Chen is very serious about the potential profitability of his canned air products, he has stressed that this air venture is also to call attention to a critical issue facing China. This week the Guardian reported that Beijing’s air pollution is “again at danger levels” and residents have been advised to stay indoors as much as they can. Chen has pulled other publicity stunts in the past to highlight the dire state of China’s air quality, such as using a hammer to smash up a number of electric scooters (with lead acid batteries) in protest of lead contamination and bring awareness to pollution. I’d like to remind Philanthropist Chen, that the way to solve China’s pollution problem is through renewable energy such as Solar Energy! We encourage all Chinese to direct their attention to renewable/solar energy, away from fossil fuel or Diaoyu Island. (Please click on red links below for more information). Solar Impulse is a Swiss long-range solar powered aircraft project being undertaken at the École Polytechnique Fédérale de Lausanne. The project eventually hopes to achieve the first circumnavigation of the Earth by a piloted fixed-wing aircraft using only solar power. The project is led by Swiss psychiatrist and aeronaut Bertrand Piccard, who co-piloted the first balloon to circle the world non-stop, and Swiss businessman André Borschberg. The first aircraft, bearing the Swiss aircraft registration code of HB-SIA, is a single-seater monoplane, capable of taking off under its own power, and intended to remain airborne up to 36 hours. This aircraft first flew an entire diurnal solar cycle, including nearly nine hours of night flying, in a 26-hour flight on July 7-8, 2010. In 2012, Piccard and Borschberg conducted successful solar flights from Switzerland to Spain and Morocco. In 2013, plans call for a flight from California to Virginia. Building on the experience of this prototype, a slightly larger follow-on design (HB-SIB) is planned to make a circumnavigation of the globe in 20–25 days. This flight was initially planned for 2014, but following a structural failure of the aircraft’s main spar during static testing, a more likely date is 2015. Piccard initiated the Solar Impulse project in 2003. By 2009, he had assembled a multi-disciplinary team of 50 specialists from six countries, assisted by about 100 outside advisers. The project is financed by a number of private companies. 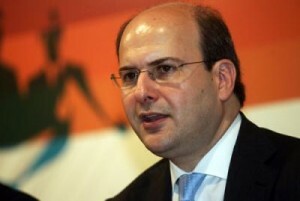 The four main partners are Deutsche Bank, Omega SA, Solvay, and Schindler. Other partners include Bayer MaterialScience, Altran and Swisscom. Other supporters include Clarins, Semper, Toyota, BKW and STG. The EPFL, the European Space Agency (ESA) and Dassault have provided additional technical expertise, while SunPower provided the aircraft’s photovoltaic cells. With a non-pressurized cockpit and a limited flight ceiling, the HB-SIA is primarily a demonstrator design. The plane has a similar wingspan to the Airbus A340 airliner. Under the wing are four nacelles, each with a set of lithium polymer batteries, a 10 hp (7.5 kW) motor and a twin-bladed propeller. To keep the wing as light as possible, a customised carbon fibre honeycomb sandwich structure is used. 11,628 photovoltaic cells on the upper wing surface and the horizontal stabilizer generate electricity during the day. These both propel the plane and charge its batteries to allow flight at night, theoretically enabling the single-seat plane to stay in the air indefinitely. The first manned flight overnight lasted about 26 hours in July of 2010. The aircraft’s major design constraint is the capacity of the lithium polymer batteries. Over an ideal 24-hour cycle, the motors will deliver a combined average of about 8 hp (6 kW), roughly the power used by the Wright brothers‘ pioneering Flyer in 1903. As well as the charge stored in its batteries, the aircraft uses the potential energy of height gained during the day to power its night flights. 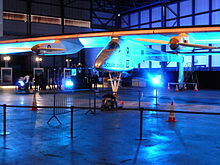 On June 26, 2009, the Solar Impulse was first presented to the public in Dübendorf, Switzerland. Following taxi testing, a short-hop test flight was made on December 3, 2009, piloted by Markus Scherdel. On April 7, 2010, the HB-SIA conducted an extended 87-minute test flight, piloted by Markus Scherdel. This flight reached an altitude of 1,200 m (3,937 ft). after completing a 13-hour flight from its home base in Switzerland. It was the first international flight by the Solar Impulse, which flew at an average altitude of 6,000 ft (1,829 m) for a distance of 630 km (391 mi), with an average speed of 50 km/h (31 mph). The aircraft’s slow cruising speed required operating at a mid-altitude, allowing much faster air traffic to be routed around it. The aircraft was piloted by Andre Borschberg. The project’s other co-founder, Bertrand Piccard, said in an interview after the landing: “Our goal is to create a revolution in the minds of people…to promote solar energies — not necessarily a revolution in aviation.“ A second international flight to the Paris Air Show was attempted on June 12, 2011, but the plane turned back half-way and landed back in Brussels, where it had taken off, due to adverse weather conditions. In a second attempt on June 14, André Borschberg successfully landed the aircraft at Paris’ Le Bourget Airport at 9:15 pm after a 16-hour flight. Construction of the second Solar Impulse aircraft, carrying the Swiss registration HB-SIB, started in 2011. It will feature a larger, pressurized cockpit and advanced avionics to allow for transcontinental and trans-oceanic flights. Supplemental oxygen and various other environmental support systems will allow the pilot to cruise at an altitude of 12,000 meters (39,000 ft). The wingspan of HB-SIB will be 80.0 m (262.5 ft), slightly wider than an Airbus A380, the world’s largest passenger airliner,but unlike the 500-ton A380, the carbon-fibre Solar Impulse will weigh little more than an average automobile. Completion was planned for 2013, with a circumnavigation of the globe in 20–25 days in 2014. However, following a structural failure of the main spar during static tests, a more likely date for the circumnavigation is 2015. The flight would circle the world in the northern hemisphere, near the equator. Five stops are planned to allow changes of pilots. Each leg of the flight will last three to four days, limited by the physiology of each pilot. Once improved battery efficiency makes it possible to reduce the aircraft’s weight, a two-seater is envisaged to make a non-stop circumnavigation. 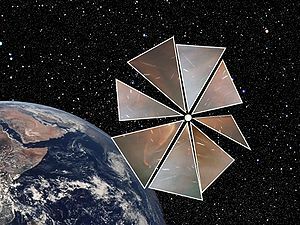 is a small satellite built by NASA‘s Marshall Space Flight Center and Ames Research Center to study the deployment of a solar sail in space. It is a three-unit CubeSat measuring 30 by 10 by 10 centimeters (12 × 3.9 × 3.9 inches), with a mass of 4 kilograms (8.8 lb). Its solar sail has an area of 10 square meters (110 sq ft), and was deployed in around five seconds. It was planned to be deployed from the FASTSAT satellite around December 3, 2010, two weeks after launch. The satellite did not eject at that time, but on January 17, 2011, it ejected on its own and deployed its sail three days later on the 20th. The beacon signal began transmitting after ejection and was first received on the afternoon of January 19, 2011. We look forward to more future solar sailings in interstellar flights, privately or publicly funded. Today’s post will be on a solar propelled vehicle of a different kind….one that is not of the land nor sea, but of the space. As Carl Sagan had once said, “We have lingered long enough on the shores of the cosmic ocean, we are ready at last, to set sails for the stars.” With the help of solar sail, a Russian nuclear submarine fired an ICBM, converted from a weapon of mass destruction into a launch vehicle for peaceful scientific exploration, into Earth orbit. It was the first test of a revolutionary method of travel that could some day take us to the stars. 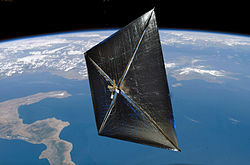 Cosmos-1 was the world’s first solar sail spacecraft, using the pressure from sunlight to propel spacecraft between planets without fuel, launched into space at 15:46:09 EDT (19:46:09 UTC) on June 21, 2005. The Planetary Society (a global membership organization and Earth’s largest space interest group) and Cosmos Studio (a venture in science-based entertainment that seeks to inspire and uplift, have cooperatively created this privately funded space mission. The goal was to capture the world’s imagination and spur its governments to work together, to initiate a new golden age of exploration. The Babakin Space Center and Space Research Institute in Russia developed the spacecraft under the direction of a team of American scientists and engineers led by The Planetary Society. Had the mission been successful, it would have been the first ever orbital use of a solar sail to speed up a spacecraft. This privately funded spacecraft, aimed to demonstrate solar sailing for the first time, appeared to have been lost in space and the ground controllers have failed to make contact with the craft the day after its launch. But it was possible that it might have reached orbit and for some reason remained silent. Cosmos-1, launched from the Barents Sea on a Volna rocket. The huge, reflective sail should have deployed in an 800 km orbit. The project budget was US $4 million. The Planetary Society planned to raise another $4 million for Cosmos 2, a reimplementation of the experiment provisionally to be launched on a Soyuz resupply mission to the International Space Station. The Discovery Channel was an early investor. However, advances in technology and the greater availability of lower mass piggyback slots on more launch vehicles led to a redesign similar to NanoSail-D, called LightSail-1, announced in November 2009. NanoSail-D and Cosmos 2 could profoundly affect the future of science and exploration missions. Solar sailing is the only means known to achieve practical interstellar flight, so let’s hope that each future effort would be the stepping stone that will lead us closer to sailing among the stars. More on solar sailing will be coming in future posts. Once again, I’d like to point out the proclivity of solar projects to take us from time of destruction to time of peace and expansion, as Cosmos-1 had done for us. Which Is Better: Solar Powered EV or Biofuel Powered Car ? Environ Sci Technol. 2013 Jan 15;47(2):1170-6. doi: 10.1021/es302959h. Epub 2013 Jan 3. Spatially-Explicit Life Cycle Assessment of Sun-to-Wheels Transportation Pathways in the U.S.
Geyer R, Stoms D, Kallaos J.
Bren School of Environmental Science and Management, University of California , Santa Barbara, California 93106-5131, United States. Growth in biofuel production, which is meant to reduce greenhouse gas (GHG) emissions and fossil energy demand, is increasingly seen as a threat to food supply and natural habitats. Using photovoltaics (PV) to directly convert solar radiation into electricity for battery electric vehicles (BEVs) is an alternative to photosynthesis, which suffers from a very low energy conversion efficiency. Assessments need to be spatially explicit, since solar insolation and crop yields vary widely between locations. This paper therefore compares direct land use, life cycle GHG emissions and fossil fuel requirements of five different sun-to-wheels conversion pathways for every county in the contiguous U.S.: Ethanol from corn or switchgrass for internal combustion vehicles (ICVs), electricity from corn or switchgrass for BEVs, and PV electricity for BEVs. Even the most land-use efficient biomass-based pathway (i.e., switchgrass bioelectricity in U.S. counties with hypothetical crop yields of over 24 tonnes/ha) requires 29 times more land than the PV-based alternative in the same locations. PV BEV systems also have the lowest life cycle GHG emissions throughout the U.S. and the lowest fossil fuel inputs, except for locations with hypothetical switchgrass yields of 16 or more tonnes/ha. Including indirect land use effects further strengthens the case for PV. The paper shows that PV cells are far more efficient than biofuels at powering a vehicle by energy from the sun. Soliloquy, The Super Green Superyacht ! In the upcoming posts, I will bring you a series of reports on solar propelled vehicles. Please allow me to start by showing you the Soliloquy, the super-green superyacht. This 190-foot (58 m) design, with 600 sq meters of solar surface coverage and a rigid wing rig of three solar sails (which can collect enough energy during 12 hours of sun to allow the Soliloquy to run fuel-free at nearly eight knots), developed by Alastair Callender, would be able to fully propel itself using a combination of solar, wind, and hybrid marine power technology from the Australian company Solar Sailor Holdings Ltd. and will produce virtually no carbon emissions. Some may even think it looks like a metamorphic alien mothership! Today, I’d like to back track a bit and take us through some historical background on the trials and tribulations of clean energy policy in USA. With sales growing 40% annually and costs falling rapidly, solar energy technology has emerged as a core technology in America’s transition into the clean energy economy. Solar energy brings opportunities in the form of new jobs, rapid technological development, and new challenges in land use, infrastructure, and the way we distribute and store energy. Fellow solar enthusiasts, there’s much work awaiting us ! I’ve recently received show news about PV America East that will be held in Philadelphia, PA , on February 5-7. 2013, in Pennsylvania Convention Center. Washington DC, January 22, 2013 – PV America East 2013 kicks off on Tuesday, February 5 in Philadelphia with three PVA Power Sessions featuring influential speakers who will share insights on achieving business success in the solar photovoltaic (PV) industry. PV America East runs through Thursday, February 7 at the Pennsylvania Convention Center in Philadelphia and brings together solar industry professionals from the Northeast and Mid-Atlantic regions to explore the latest in solar photovoltaic (PV) products, services and technology. The show is presented by the Solar Energy Industries Association (SEIA) and the Solar Electric Power Association (SEPA). Klososky will discuss how to use new technology to find, sell and build relationships with customers in the perpetually changing landscape of the solar energy industry. He leads Future Point of View (FPOV), a thought-leading consulting and speaking firm specializing in helping clients understand and leverage emerging online technology trends. In addition to the three Power Sessions, PV America East 2013 offers a comprehensive conference program with 28 concurrent sessions and fourSolar Idea Swaps covering topics within six tracks: finance, policy, markets, innovations, working with utilities and solar multi-track. For the first time at PV America, the North American Board of Certified Energy Practitioners (NABCEP) and Solar Energy International (SEI) are providing free PV technical training and resources for installers, salespeople and other solar energy professionals. The training takes place in booth 1301 which serves as the center for information on grid-tied systems (residential, commercial and utility), grid-tied with battery back-up systems, and stand-alone systems. The sessions are taught by subject matter experts and topics range from software to safety practices, maintenance and sales. Elite PV America East 2013 sponsors include: ReneSola, Canadian Solar and Suntech. PV America East is presented by the Solar Energy Industries Association (SEIA)® and Solar Electric Power Association (SEPA)®, whose combined efforts have created a world-class, regionally focused and vertically integrated event for installers, designers and suppliers of photovoltaic (PV) technology and services. Unlike other PV conferences, all proceeds support the expansion of the U.S. solar energy market through SEIA’s and SEPA’s year-round research and education activities, as well as SEIA’s® advocacy efforts. Is It A Solar Pocket Factory or A Microbrewery of Panel Production ?